Let me explain. The authors collected every significant clinical study of drugs and dietary supplements for the treatment or prevention of cardiovascular disease between 1974 and 2012. Then they displayed them on a scatterplot. The number of NHLBI trials reporting positive results declined after the year 2000. 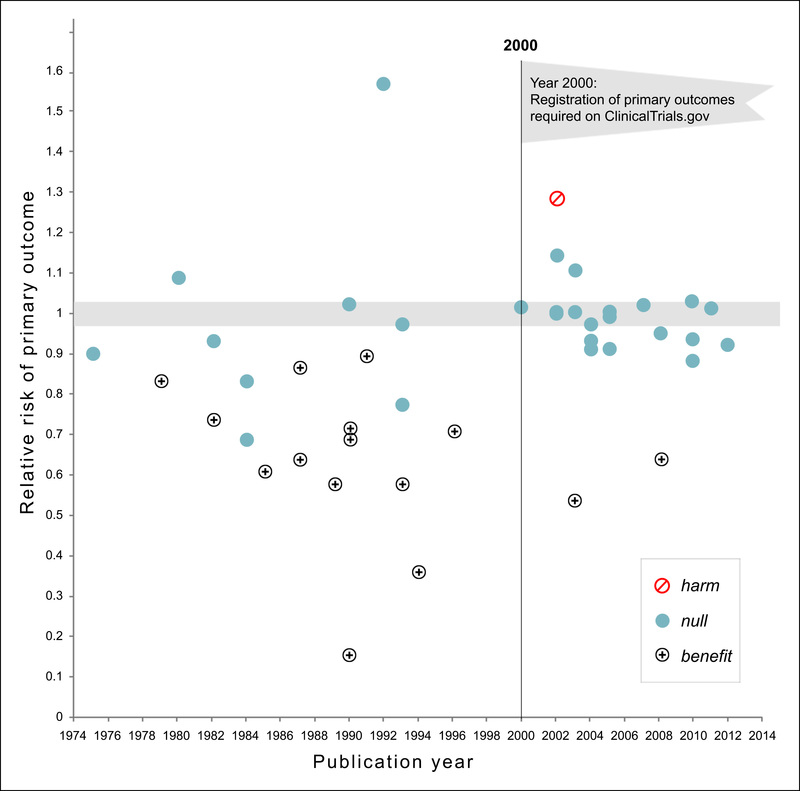 Prospective declaration of outcomes in RCTs, and the adoption of transparent reporting standards, as required by clinicaltrials.gov, may have contributed to the trend toward null findings. Before 2000, researchers cheated outrageously. They tortured their data relentlessly until they found something—anything—that could be spun as a positive result, even if it had nothing to do with what they were looking for in the first place. After that behavior was banned, they stopped finding positive results. Once they had to explain beforehand what primary outcome they were looking for, practically every study came up null. The drugs turned out to be useless. Is this because scientists are under pressure from pharmaceutical companies to show positive results, and before 2000 they did exactly that? Or is it because scientists just like reporting positive results if they can? After all, who wants to spend years of their life on a bit of research that ends up being a nothingburger? I guess we’ll never know. But one thing we do know: we need to keep as sharp an eye on scientists as we do on anyone else, especially if there’s a lot of money at stake. When we don’t, they’re just as vulnerable to pressure and hopeful thinking as anyone.